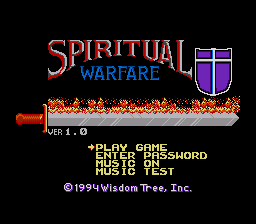 Spiritual Warfare is an unlicensed Sega Mega Drive game developed and published by Wisdom Tree in 1994. It is extremely similar to The Legend of Zelda for the NES, however as with all Wisdom Tree games, is linked to Christian themes such as the stories of the Bible. The game was only released in North America. Other versions of this game exist for the NES, IBM PC and Game Boy.